Distributed ledger technologies, or blockchain, is gaining momentum across the globe. What's the appeal to apply the new eCommerce related benefits? There's no proprietary owner or administrator. As a result, interest in open blockchain technologies -- such as Hyperledger -- are attracting many new ecosystem participants. According to the latest global market study by International Data Corporation (IDC), Western Europe will be the second largest region at a worldwide level, starting from around $200 million in 2017, including all the experimentation projects. The initial investment in proof-of-concept use cases will nearly triple the spending in 2018, to reach $1.8 billion in 2021. There is interest in blockchain across industries, with the compound annual growth rate (CAGR) expected to be 66.6 percent during 2016–2021. 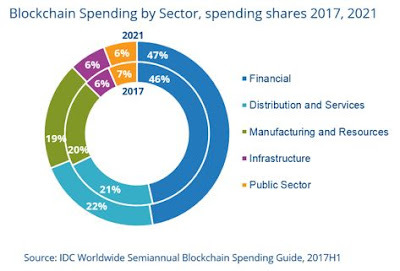 "During 2017 many companies across a wide range of industries started to understand the feasibility, sustainability, and potential deployment of blockchain," said Carla La Croce, research analyst at IDC. "2018 will be the year of blockchain." Blockchain spending will be driven by the financial sector (46.7 percent of 2018 spending), led by the banking industry, which will account for around $260 million of the total. The second largest spender will be the distribution and services sector (nearly $120 million in 2018), with the retail and professional services industries as the largest, while the manufacturing and resources sector ($112 million in 2018) will be driven by the discrete and process manufacturing industries. IDC expects the highest growth to be in telecommunications (79.1 percent CAGR), professional services (77.2 percent CAGR), and healthcare (76.7 percent CAGR). Overall, cross-border payments and settlements will see the largest spending in 2018 (nearly $70 million), followed by regulatory compliance ($66 million) and asset or goods management ($61 million). From a technology perspective, hardware will take a very small share of spending, with the major investments in services, which in 2018 will account for around 68 percent of Western European blockchain spending; the two main components, IT services and business services, will be well balanced across the forecast. Software will account for less than a quarter of spending, with the blockchain platform the main driver, and one of the fastest growing categories overall, along with security software. "Blockchain is a great opportunity for many companies to transform inefficient processes into efficient and secure ones. In particular, blockchain is seen as a broad digital transformation enabler that can empower new business outcomes," said La Croce. "Opportunities are huge, and investments are needed in terms of looking for new use cases, keeping a strategic interaction between vendors and end users, and recruiting blockchain talent.